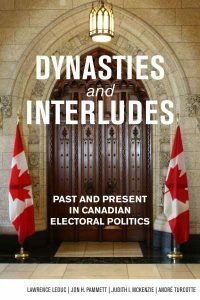 Dynasties and Interludes provides a comprehensive and unique overview of elections and voting in Canada from Confederation to the recent spate of minority governments. Its principal argument is that the Canadian political landscape has consisted of long periods of hegemony of a single party and/or leader (dynasties), punctuated by short, sharp disruptions brought about by the sudden rise of new parties, leaders, or social movements (interludes). Changes in the composition of the electorate and in the technology and professionalization of election campaigns are also examined in this book, both to provide a better understanding of key turning points in Canadian history and a deeper interpretation of present-day electoral politics.